Onions are members of the allium family, related to garlic and chives, and are used in culinary dishes, raw or cooked. Onions are easily grown in almost any soil type, and once they are planted require no fuss. An onion bulb for planting is also referred to as an onion "set," and it is described by Texas A&M University Extension as a bulb, up to one inch in diameter, that produces a larger bulb when planted. Planting onion bulbs, or sets, in springtime encourages bulb growth, and will allow you to have a harvest by August. Work your soil in the spring using a rototiller or hoe. To work the ground, dig it up and loosen the soil. A rototiller will do this automatically, but if you are using a hoe, chop into the ground three inches and keep turning over the dirt until you have loosened it up. For onions, the ground does not need to be worked more than four inches deep. Add fertilizer to the soil at this time. Oregon State University recommends a 16-16-16 mix, which can be found at any nursery or lawn and garden center. Sprinkle 1/2 cup of fertilizer down a 10 foot row and work two inches into the soil by turning the soil over with the hoe. You can fertilize once again, three weeks after planting, with a liquid or pelleted fertilizer if desired. For the best fertilizer to use in your growing region, speak to a professional at a local garden center. Moisten the soil. You want it to be damp, but not soaking wet. Plant the onion bulbs, or sets, one inch below the soil, with the pointed end facing up. Space the bulbs four inches apart. If you are growing your onion sets for green onions, the spacing can be up to two inches apart, or almost touching. Onions can be eaten at any stage of growth. 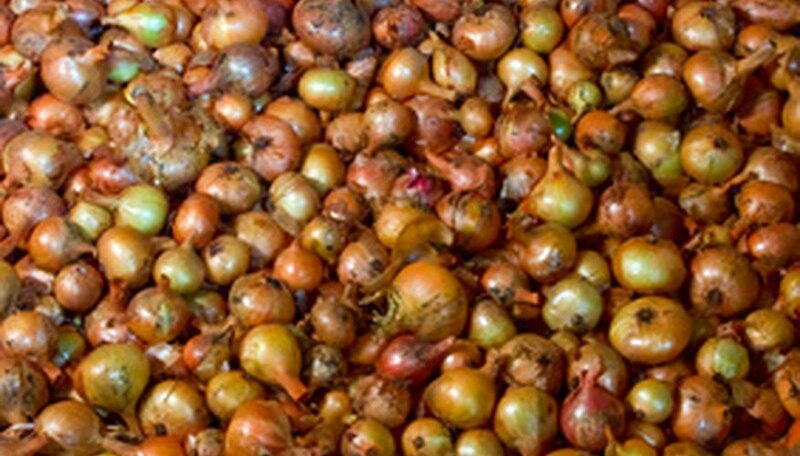 Drying is recommended if you need to store the onion, but not necessary in order to eat them. Pull and discard any onions that flower. While flowering is normal for garlic, if an onion flowers it will not produce a good bulb.